Polenta is a hearty and amazingly delicious dish made from boiled cornmeal. What follows is a simple recipe that truly highlights fresh, UP Certified Extra Virgin Olive Oil. This recipe is a crowd pleaser that requires very few steps! Bring 4 cups of lightly salted water to a boil in a medium sauce pot. Gradually add in 1 cup of polenta (cornmeal), and reduce heat to medium. 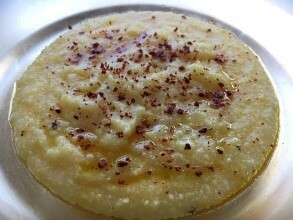 While polenta is cooking, add 1 teaspoon garlic powder, fresh ground black pepper to taste and the star of the show: 1 tablespoon of EVOO and two teaspoons of Garlic Olive Oil. Reduce to a simmer, stirring occasionally for approximately 20-25 minutes to create a smooth, creamy consistency. When finished cooking, ladle into bowls and, for the finishing touch, drizzle a bit of Garlic Olive Oil on top, and sprinkle with red pepper flakes.